481 Beacon is located on the south side of Beacon, between Hereford and Massachusetts Avenue, with 479 Beacon to the east and 483 Beacon to the west. 481 Beacon was designed by architect Ernest N. Boyden and built in 1891 by John Hurley, mason, for real estate dealer Seth Russell Baker, one of three contiguous four-unit apartment houses (479-481-483 Beacon). 483 Beacon was razed in about 1898 for construction of the Hotel Cambridge. Seth Baker is shown as the owner on the original building permit applications for 479 Beacon and 481 Beacon, both dated March 9, 1891; the application for 483 Beacon has not been located. 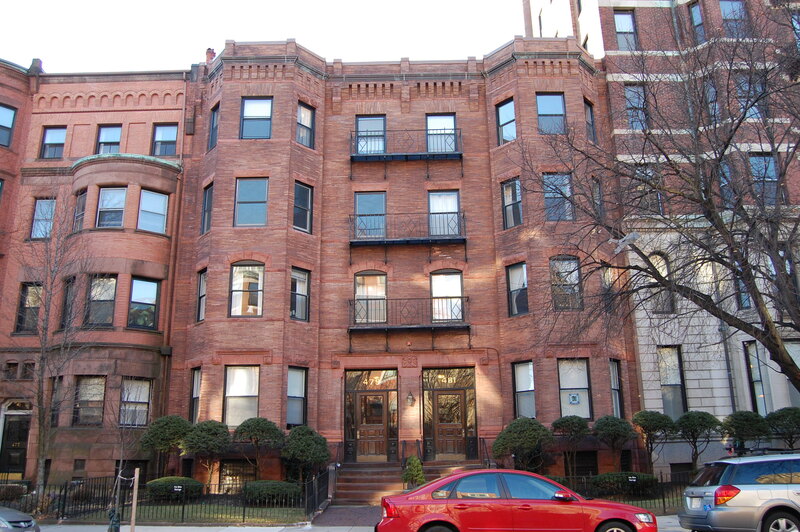 Also in 1891, Ernest Boyden designed and John Hurley built two additional multi-family buildings for Seth Baker across Massachusetts Avenue at 491 Beacon (21-23 Massachusetts) and 25-27 Massachusetts Avenue. Seth Baker bought the land for 479-481-483 Beacon on January 20, 1891, from Frances Anne (Codman) Sturgis, the widow of architect John Hubbard Sturgis. The lot, with a 79 foot frontage, was part of a 375 foot parcel John H. Sturgis purchased on January 24, 1880, from a real estate investment trust formed by Grenville T. W. Braman, Henry D. Hyde, and Frank W. Andrews. The trust had purchased the land from the Boston Water Power Company on March 1, 1872. The 375 foot parcel was one of three John H. Sturgis had purchased in January and February of 1880 comprising all of the land on the south side of Beacon from a line 198 feet west of Hereford to Massachusetts Avenue, with a frontage of 442 feet. 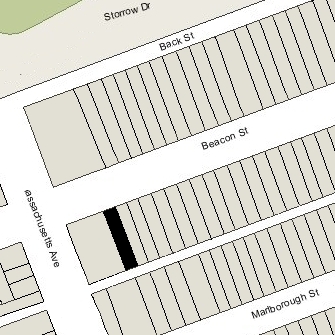 Click here for an index to the deeds for 481 Beacon, and click here for further information on the land on the south side of Beacon between Hereford and Massachusetts Avenue. On October 1, 1891, 479-481-483 Beacon were purchased from Seth Baker by Eugene Hamilton Fay. He and his wife, Emma Frances (Hutchins) Lewis Fay, lived in Chelsea. He was associated with Henry W. Savage, listing himself in the City Directories as a clerk at the same business address. On January 2, 1892, 481 Beacon was purchased from Eugene Fay by John Perkins Cushing, owner of an electro-machinist company. He was unmarried lived at 170 Beacon with his parents, John Gardiner Cushing and Susan Prescott (Dexter) Cushing. Eugene Fay had sold 483 Beacon in October of 1891 and 479 Beacon in November of 1891. 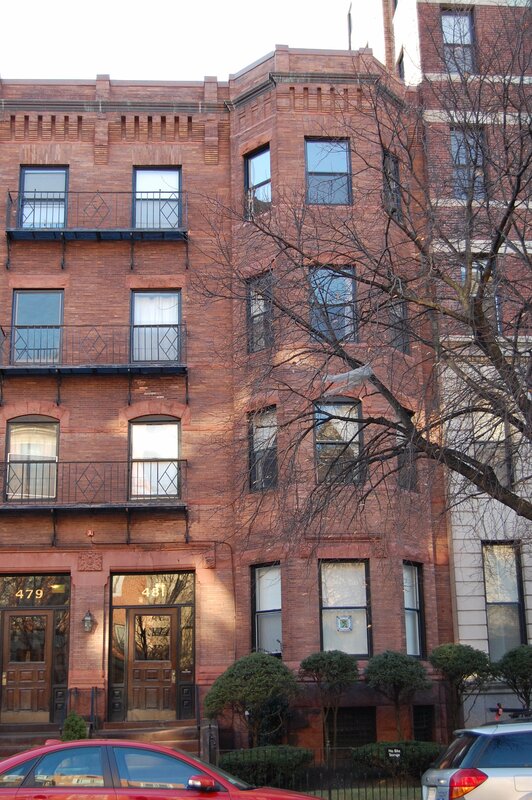 Among the first residents of 481 Beacon were Charles Dale Turnbull and his wife, Maria (May) (Peck) Turnbull. They had married in October of 1891, and 481 Beacon was their first home together. Prior to their marriage, he had lived at 111 Beacon with his mother, Mary Bliss (Dale) Turnbull, the widow of Charles Nesbit Turnbull. When Charles and Maria Turnbull moved to an apartment at 481 Beacon, his mother moved to an apartment at 479 Beacon. By the 1892-1893 winter season, they all had moved to the Hotel Ludlow (southwest corner of Clarendon and St. James), where they remained until the 1900-1901 season, when Charles and Maria Turnbull they moved to 275 Clarendon and his mother moved to the Hotel Hamilton at 260 Clarendon. On June 30, 1892, 481 Beacon was purchased from John P. Cushing by Washington Butcher Thomas. He had purchased 479 Beacon earlier that month. The two properties subsequently remained under the same ownership. Washington Thomas and his wife, Caroline (Wadleigh) Thomas, lived at 20 Gloucester. He was a sugar manufacturer and an investor in real estate. In 1895-1896, he built The Marlborough apartments at 416 Marlborough. Washington B. Thomas purchased 483 Beacon in April of 1896, and in May of 1896 he purchased the empty lot at the corner of Beacon and Massachusetts Avenue. He subsequently demolished 483 Beacon and 1898 built Hotel Cambridge on the combined lot. By the 1899-1900 winter season, one of the apartments at 481 Beacon was the home and office of Dr. Jane Downes Kelly, a physician and surgeon. She previously had lived and maintained her office at 199 Marlborough (10 Exeter). 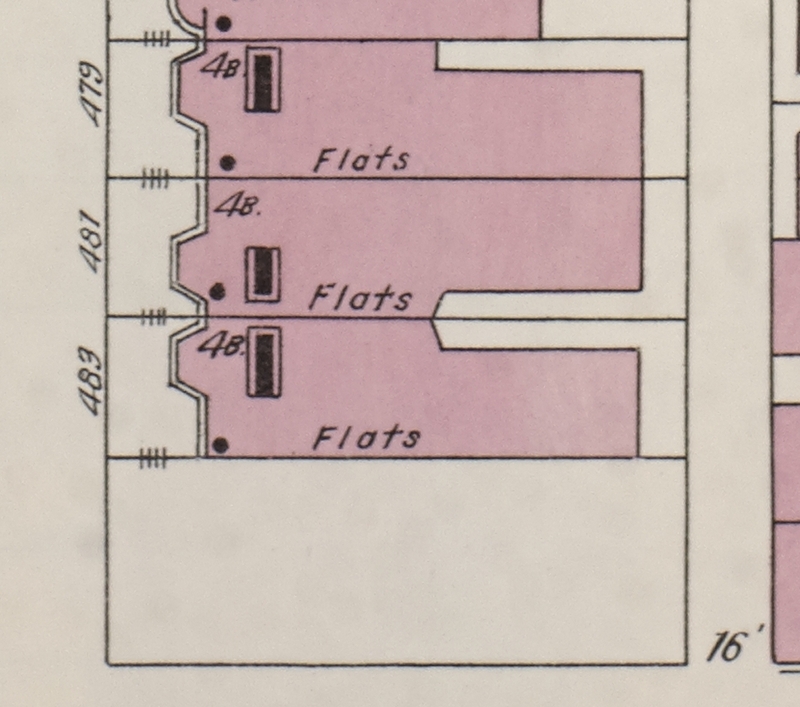 In August of 1900, she married to Wallace Clement Sabine, a physicist who taught at Harvard and later would become a noted acoustician, credited with founding the field of architectural acoustics. After their marriage, they lived at 481 Beacon. He previously had lived in Cambridge. They continued to live at 481 Beacon (and she to maintained her medical office there) during the 1908-1909 winter season, but moved thereafter to 348 Marlborough.